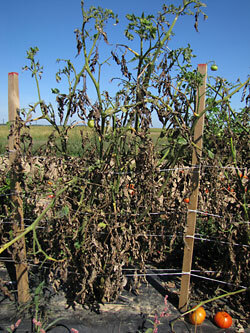 Late blight has been occurring routinely in the northeastern USA, starting early in the growing season and severely impacting tomatoes since 2009. During the past four years on Long Island, NY, symptoms have been first seen in late May to mid June. This disease occurred sporadically before 2009, with symptoms never found or not seen until October in most years on Long Island. Change in occurrence of late blight is at least partly due to the fact there are new genotypes (strains) of the pathogen in the USA. Many are more aggressive on tomato and more tolerant of warm temperatures than genotypes like US-1 and US-8 that previously were dominant. Resistant varieties are a valuable tool for managing diseases, particularly late blight, because it can be very difficult to control with fungicide applications started after onset and it cannot be ‘tolerated’. 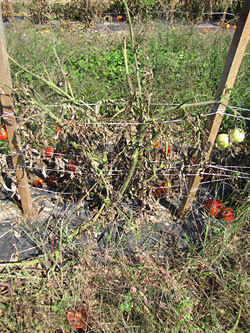 Left unmanaged, late blight is much more likely than other diseases to completely destroy a crop and also to have devastating impact on other tomato plantings in a region due to the quantity of pathogen spores that can be produced and easily dispersed by wind. 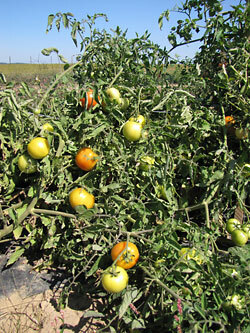 A replicated experiment was conducted at the Long Island Horticultural Research and Extension Center (LIHREC) in 2013 to evaluate new varieties that have resistance to late blight in terms of horticultural traits and susceptibility to diseases. Mt Fresh Plus was included as the industry standard for comparison. Most varieties evaluated produce standard red, round, slicer (beefsteak) type fruit. Plum, cherry, and campari (large cherry) types were also tested. All varieties tested are commercially available. One, Iron Lady, also has resistance to early blight and Septoria leaf spot, common foliar diseases occurring in the northeastern USA. It is from the Cornell Breeding Program. Methods: The experiment was conducted in a field dedicated to research on organically-produced crops since 2001. Organic fertilizer at 105 lb/A N was spread over rows to be planted, then incorporated. Three products were used each at 700 lb/A: Pro-Grow 5-3-4, Cheep Cheep 4-3-3, and 6-0-6 Cottonseed blend. Next drip tape was laid as the rows were covered with black plastic mulch. A living mulch was established by broadcasting a combination of annual ryegrass seed and clover seed with a hand-operated spreader between rows of plastic mulch, then lightly raking to incorporate. The living mulch plus weeds that grew were mowed routinely. Some weeds were removed by hand. 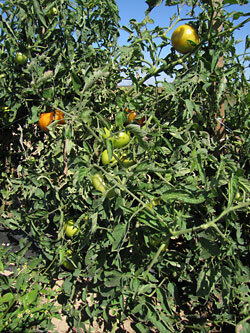 Tomato seedlings were transplanted by hand on 17 June into holes opened in the plastic mulch by a Waterwheel transplanter that also placed in the holes a starter fertilizer, Neptune’s Harvest Benefits of Fish (2-4-1 N-P-K). A completely randomized block design with four replications was used. 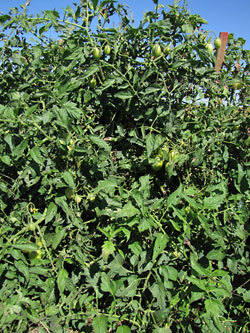 Plots consisted of 10 plants in a single row with 24-in. plant spacing and 68-in. row spacing. 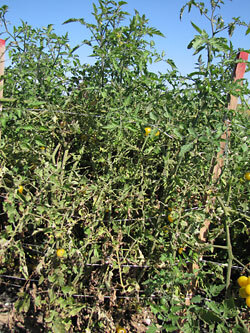 A yellow cherry-type tomato plant (variety Sungold) separated plots within rows. 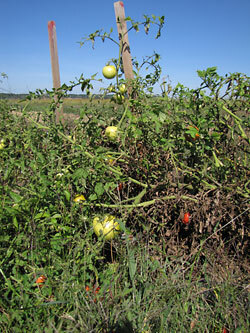 Following standard procedure for fresh-market tomato production on Long Island, plants were staked and trellised as they grew using the Florida weave trellising system with 4-ft stakes placed between plants. No fungicides were applied. Leaves were examined for symptoms of any foliar disease nine times from 31 July to 10 October. Late blight and other diseases observed were visually assessed by estimating the percentage of leaves in each plot with symptoms (incidence) and the severity of symptoms on these affected leaves. Canopy severity was calculated by multiplying these values. Area Under Disease Progress Curve (AUDPC) was calculated for late blight severity from 6 September through 10 October for all entries. 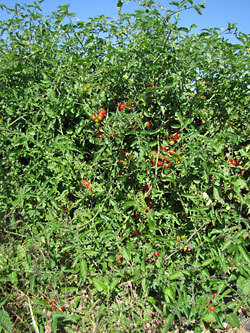 Ripe fruit were harvested on 21 and 30 August; 6, 13, 20, and 26 September; and 10 October. Yield was not measured for the three entries with cherry-type fruit. Fruit quality was evaluated by project staff and by public groups. Attributes assessed included appearance, taste, and overall quality rated on a 1-5 scale with 5 being excellent. Results and Discussion: All entries with Ph-2 and Ph-3 major genes for resistance exhibited good suppression of late blight, confirming results obtained in a similar evaluation in 2012 (Table 1). This was most evident on 12 September. Iron Lady is the only variety with homozygous resistance (Ph-2 and Ph-3 genes from both parents); in contrast with expectation, it was not significantly less severely affected by late blight than the other three varieties with heterozygous resistance (one copy of Ph-2 and Ph-3)(Mountain Merit, Defiant PHR, and Mountain Magic). Canopy severity of late blight on 12 September was 72% for Mountain Fresh Plus, the susceptible variety included for comparison, and 1-3% for the four resistant varieties. Four entries with unknown resistance also effectively suppressed late blight: Matt's Wild Cherry (0% severity on 12 September), Lemon Drop (6%), Jasper (9%), and Mr Stripey (12%). These were included in the evaluation because they exhibited resistance in other evaluations. Mountain Magic and Matt's Wild Cherry were the most effective of all entries exhibiting resistance. They exhibited 93% and 98% control, respectively, over the entire assessment period (AUDPC values) compared to Mountain Fresh Plus. The entry with just Ph-3, Plum Regal (homozygous Ph-3), was effective compared to Mountain Fresh Plus only based on the 6 September assessment (25% versus 79% severity). Both New Yorker (Ph-1) and Legend OP (Ph-2) were as severely affected by late blight as the susceptible varieties, which suggests neither Ph-1 nor Ph-2 on their own are effective against US-23, which was the most common genotype of the pathogen in the northeast USA in 2012 and 2013, and thus most likely will dominate in 2014. Plum Regal and Legend OP provided some suppression in 2012 in an evaluation at this location; however, all plants in that experiment were sprayed five times with organic fungicides labeled for managing late blight. Few symptoms were observed of powdery mildew and Septoria leaf spot. No significant differences were detected among the entries. 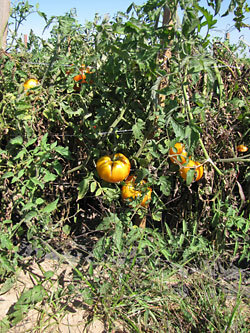 Most tomatoes evaluated produce red slicer-type fruit. The susceptible variety, Mountain Fresh Plus, produced the fewest marketable fruit (Table 2). Defiant yielded the most fruit among all varieties producing red slicer-type fruit. These varieties did not differ significantly from all of the others. Jasper, Matt's Wild Cherry, and Mountain Magic were the varieties that rated highest for taste (average rating >4) and ‘would buy’ (>89%) by public groups participating in evaluations (Tables 3 and 4). Lemon Drop also was rated high. Among red slicer-types, Defiant and Mt Merit rated similarly high (3.7 for taste and 76-77% indicated they would buy these). Another experiment was conducted at LIHREC in 2013 focused on evaluating new varieties being developed by Johnny’s Selected Seeds. Three experimentals with different fruit type (cherry, cocktail, and saladette types) exhibited good suppression of late blight and produced fruit of good quality. In this experiment, Jasper had the least symptoms, but did not differ significantly from these experimentals. Jasper rated highest for flavor (4.9 out of 5). 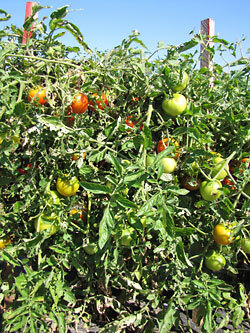 Organic growers on Long Island who grew late blight-resistant varieties in 2013 were satisfied with the varieties and control achieved, and appreciated the insurance provided by plant resistance to such a destructive disease that can occur unpredictably. Acknowledgments: This project was funded by the Agriculture and Food Research Initiative Competitive Grants Program Grant 2011-68004-30154 from the USDA National Institute of Food and Agriculture. Table 1. Severity of late blight on tomato varieties evaluated at LIHREC in 2013.
z Numbers in each column with a letter in common are not significantly different from each other (Tukey’s HSD, P=0.05). ND=not determined because too few leaves remained in plots to assess. Decline in severity over time for varieties severely affected at the first assessment reflects defoliation caused by late blight. Also, conditions late in the season were dry and thus not very favorable for late blight development. y Entries are listed based on a combination of severity, resistance genes, and fruit type. x AUDPC values were square root transformed before analysis. Table contains de-transformed values. Table 2. Yield of tomato varieties grown at LIHREC, 2013.
z Numbers in each column with a letter in common are not significantly different from each other (Tukey’s HSD, P=0.05). ND=not determined; all ripe fruit were not harvested from small-fruited varieties. y 'Total' includes marketable and unmarketable fruit. x BE= Bejo Seeds, HMS=High Mowing Seeds, JS=Johnny's Selected Seeds, H=Harris, TGS=Tomato Growers Supply, and TT=Totally Tomato. w 'All' includes the yield from all harvest dates which were: 21 Aug, 30 Aug, 6 Sep, 13 Sep, 20 Sep, 26 Sep, 3 Oct, and 10 Oct.
Table 3. Combined results of tomato evaluations performed by public groups in 2013. Results are organized by average Overall fruit rating with the best at the top. External fruit appearance, internal appearance, taste and overall quality ratings done on a 1 (poor) to 5 (excellent) scale. “Would Buy It” has percentage of evaluators who would purchase fruit of this variety. Table 4. 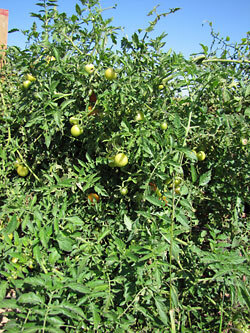 Tomato fruit evaluation conducted by a gardening group in 2013. Results are organized by average Overall fruit rating with the best at the top. 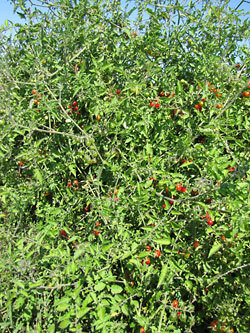 Following images are of plants in this evaluation on 20 September 2013. 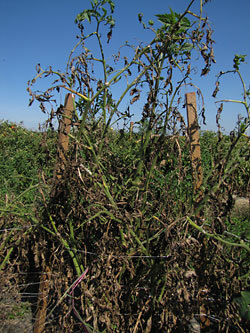 Variety's gene(s) for resistance to late blight are after its name.